Shepherd’s Pie is a hearty, filling dish featuring meat, vegetables, and gravy under a fluffy bed of mashed potatoes. Bake this up for some ultimate comfort food. You ready for some good old fashioned, comfort food? Well then, Shepherd’s Pie is where it’s at. 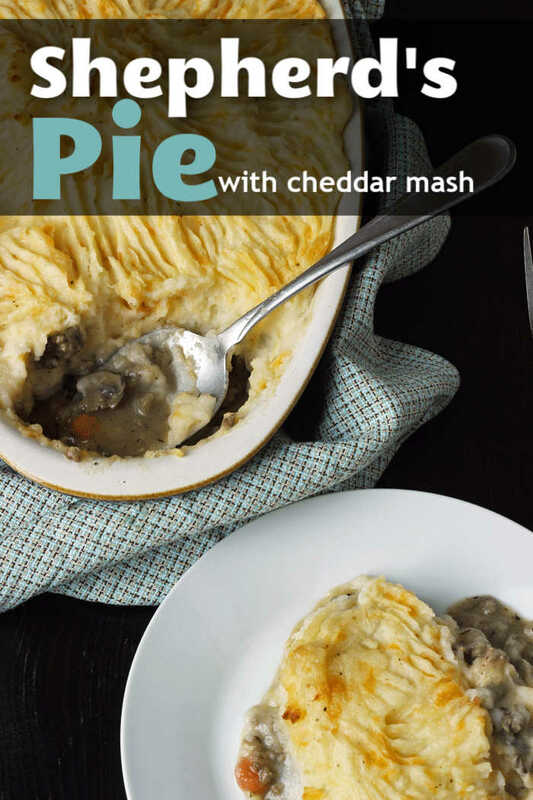 Tender veggies, hearty meat, luscious gravy, all topped with creamy mashed potatoes flecked with bits of cheddar cheese. It’s pretty much comfort on a plate. If you’ve been dreaming about this kind of comfort food, then it’s high time you dished it up. Just be sure that you don’t leave the room for a quick second and come back to find out that there’s none left! It’s that good. Yes, ma’am. This pie comes together so easily and is freezer friendly, so it’s totally worth your while to make at least a double batch. Shepherd’s Pie is rustic, hearty comfort food. It doesn’t need anything special. Sure, you can spoon the mashed potatoes into a piping bag to make the topping all fancy, but really, it’s not necessary. Besides, why waste that good potatoes that gets left behind in the bag? Interestingly enough, St. Patrick was actually a shepherd before he became a priest and later a missionary to Ireland. He was born on the island of Great Britain during the Roman occupation, sometime during the 5th century. During his teens he was kidnapped by Celtic pirates and enslaved as a shepherd on Ireland. During his time in slavery, he became a Christian (his captors were pagans), and eventually escaped. However, he had come to love the Irish people and later returned to preach the good news to them. I like to think of Shepherd’s Pie and Irish Stew as more authentic tributes to the guy for whom St. Patrick’s Day was named. Shepherd’s Pie, also known as Cottage Pie, is a meat pie topped with mashed potatoes. 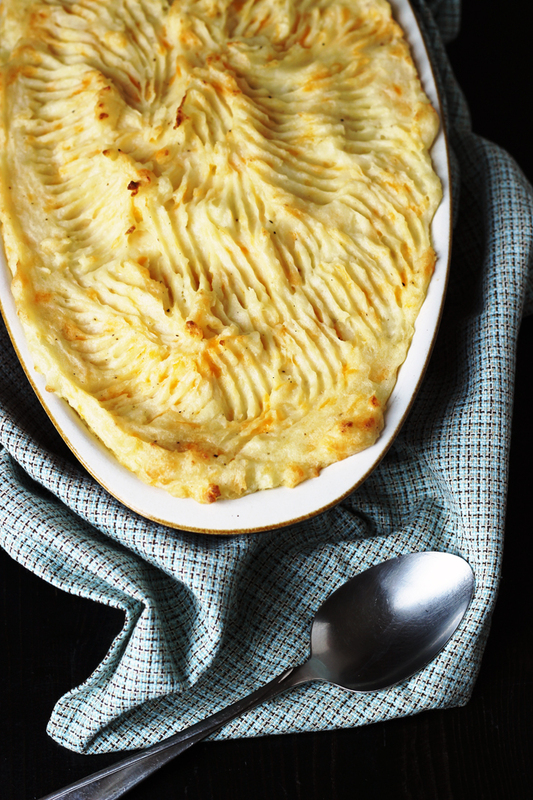 Traditionally, a cottage pie contains beef, while a shepherd’s pie contains lamb. However, since I’m in the US where lamb is expensive and/or hard to come by, I’m using the term loosely. And if I’m going to be completely honest, the dish probably wasn’t in existence when Patrick walked the earth, as neither version (cottage or shepherd) is known to be prepared prior to the late 18th century. That said, it is a traditional Irish dish while corned beef decidedly is not. 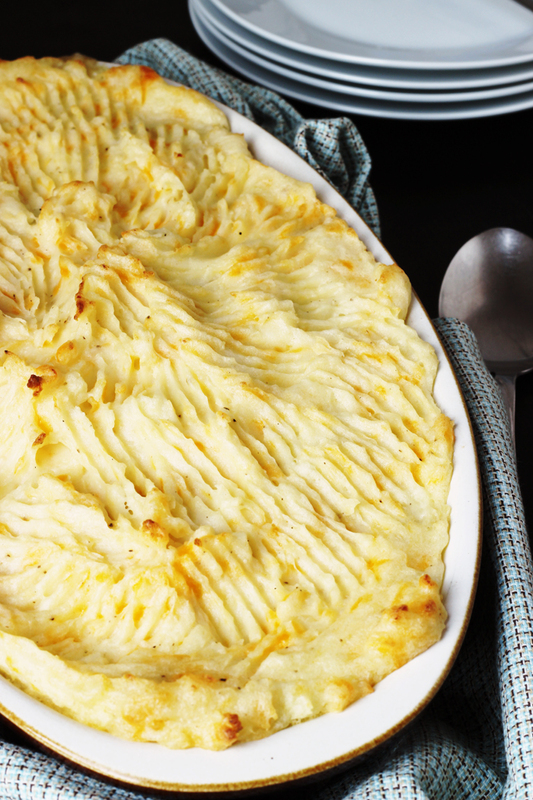 What meat do you use for Shepherd’s Pie? Traditionally, you would stick to using beef or lamb in shepherd’s pie, however, you can really use any kind of meat that you like. Ground beef, lamb, turkey, or pork are easiest for this particular recipe. And to up the versatility factor, you can include any vegetables you have on hand, though my family obviously prefers mushrooms, onions, carrots, and green beans. Peas are more authentic, but my husband doesn’t like that. Yes, you can freeze shepherd’s pie which makes it a nice addition to your freezer meals repertoire. I recommend assembling the pie after the potatoes and filling have cooled off a bit. Do not bake it prior to freezing. Instead, chill it completely, wrap well for freezing, label, and freeze. You can bake it from frozen, adding about 20 to 30 minutes baking time, or thaw it completely and proceed as directed here. Can you make Shepherd’s Pie from leftovers? Shepherd’s Pie is a great dish to use up leftovers from a big holiday meal, so feel free to use poetic license when preparing this recipe. It’s basically cooked meat, a savory gravy, cooked veggies and a topping of mashed potatoes. Like a regular Chicken Pot Pie, it’s very forgiving. Feel free to get creative by adding sour cream and chives into your mash if you like. With this recipe I stuck with a few handfuls of cheddar cheese. Yum-O! How can you make a Shepherd’s Pie easily? How can I make this dish cheaply? Stock up on ingredients when they are on sale. For instance, when I see a great price on veggies, potatoes, or chicken stock, I’ll buy lots of them and plan my meals around them. Use ground turkey. Ground turkey is generally less expensive than beef, lamb, chicken, or pork. Use up leftovers. It doesn’t matter what kind of veggies you throw in. They add great flavor and nothing goes to waste. Feel free to adapt this basic pie recipes to use whatever meats or veggies you have on hand. Preheat the oven to 350 degrees. Grease a 2-quart baking dish with nonstick cooking spray. Meanwhile, heat the oil in a large nonstick skillet. Add the beef, onion, carrots, and mushrooms and cook until the beef is browned and the onion is translucent. Add the flour and stir until the drippings have completely absorbed the flour. Stir in the broth and spices. Simmer until thickened. Stir in the green beans or peas. Spoon this mixture into the prepared baking dish. Once the potatoes are cooked, drain them and return them to the pot. Mash the potatoes until very fine. Add the butter and continue mashing, until the butter is melted and incorporated into the potatoes. Stir in the milk and cheddar cheese. Season to taste with salt and pepper. Spoon the mashed potatoes over the meat mixture, taking care to seal the mashed potato topping all the way to the edges of the pan. At this point you can chill the pie and refrigerate to bake later or chill, cover and freeze up to 2 months. Before baking, thaw the pie in the refrigerator . Bake the pie for 30 minutes or until the filling is bubbly and the top is golden brown. If the pie is very cold, you may need to increase the baking time up to an hour. My kids were just talking about Shepherd’s Pie this week! Apparently they remember my sister serving it during a visit and they wondered why I never make it. So yesterday I added the ingredients to my shopping list and am planning to make it later next week 🙂 Thanks for the cheddar inspiration! HI Jessica, do you think this would do OK in the freezer? I never know what the rules are for freezing potatoes. Thanks!